Consider using Trion 926 instead. No Longer Available. Consider using Trion 926 as replacement. Humidistat has SPST switch that closes when humidity falls below its setting. The white plastic case has clear face plate. We measured the height at 4½ and a width of 2¾ while 2" deep (not including the knob). Vertical style. 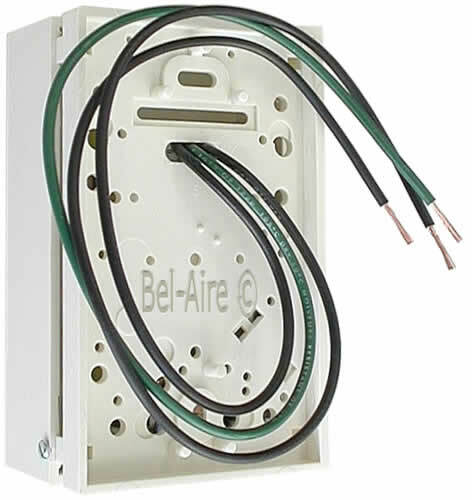 Operates with line voltage or low voltage. Electrical: ½ amp at 120 volt 60 Hz, or 60 VA at 30 vac. Three wires exit the back of the humidistat. A green wire to be connected to ground. And two black wires that are the connections to the humidistat switch. Mounts on 2x3" single gang box (not included).